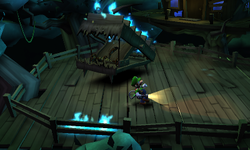 The Harsh Possessor is the second Possessor boss Luigi faces in the Nintendo 3DS game Luigi's Mansion: Dark Moon. He is fought in the Tree House of Haunted Towers, where he has taken possession of a staircase. Major Parascope activity was coming from the top of the Haunted Towers and E. Gadd sent Luigi to go investigate the scene. The Harsh Possessor while inside the staircase. 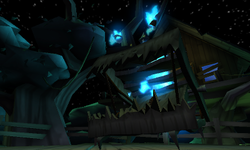 While possessing the staircase, the Harsh Possessor turns it into a giant mouth by turning the staircase inside-out. The wheels that allow the staircase to roll now forms a hinge that allows the mouth to open and shut. A blue flame burn on each of the steps of the staircase while a pair of lit torches forms its eyebrows and eyes. Its tongue is a red cord and is only shown after attempting to crush Luigi. The Harsh Possessor's true form is that of a lean white ghost with two horns protruding from the front of its head. A fragment of the Dark Moon can be seen inside of it. Luigi battling the Harsh Possessor. The main attack of the Harsh Possessor while it's inside the staircase is trying to lunge at Luigi. The Possessor will attempt to attack Luigi multiple times before flying into the air and trying to crush Luigi from above. After the Possessor has taken damage, it will start to throw two blue flames several times in a row. His lunge attack also gets progressively faster. While outside of the staircase, the Harsh Possessor can ram into Luigi twice in a row. After it finishes its second charge attack, it will be momentarily stunned and vulnerable to a Strobulb flash. In order to defeat the Harsh Possessor, Luigi must wait for him to fly into the air and attempt to crush him. If the Possessor misses, the staircase will fall, become flat, and reveal its "tongue". Luigi must use his Poltergust 5000 to stretch the tongue and send it flying back into the staircase to make the Harsh Possessor fly out. After the Harsh Possessor shows its true self, Luigi will need to stun it with the Strobulb and proceed to vacuum off one of its skins. Repeating this process twice will defeat the boss. The Harsh Possessor's weak spot being pulled by Luigi. Luigi removing one of Harsh Possessor's skins. Luigi obtains the third Dark Moon piece. 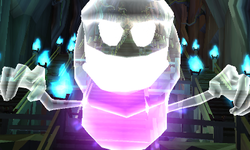 This possessor was hiding at the top of that giant tree in the Haunted Towers. He possessed a wooden staircase, of all things, and tried to eat Luigi! I thought he was going to faint! Dūe From due, Italian for "two." This page was last edited on November 30, 2017, at 20:30.